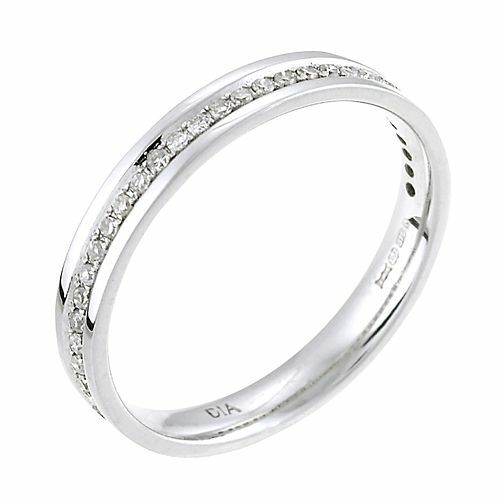 A dazzling channel set 9ct white gold, 15 point diamond wedding ring. A breath-taking ring for the woman of your dreams. 9ct White Gold 15 Point Diamond Wedding Ring is rated 5.0 out of 5 by 7. Rated 5 out of 5 by Anonymous from Excellent My Wife was over the moon, excellent product. 10/10. Rated 5 out of 5 by Anonymous from It’s not just a ring. This beautiful piece of jewellery really has made our day and goes perfectly with my husbands Palladium two tone ring.